become a fad, but there is no doubt brunch has been one of the trendiest food-related phenomenon to partake in over the last couple of years. If you are looking to have a fancy outing with your friends or simply just didn’t wake up in time for breakfast, there are plenty of places in town to get your brunch fix in. There is power in a perfect brunch, and we are here to provide you with one. Here is our list of the top 10 places to brunch properly in the Coastal Bend and the menu item you should order when you get there. 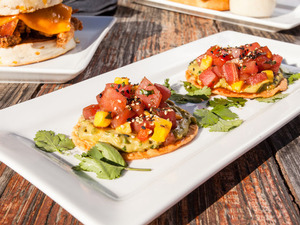 Forget about pizza for dinner—it’s taking over the brunch scene nowadays. The Breakfast Pizza at The Post comes on a grilled flat bread, with feta aioli, parmesan cheese, crispy prosciutto, baby arugula, and a fried egg, all topped with serrano honey. Is your mouth watering yet? Whether you sit inside or outside, there is a table (and a cocktail) with your name on it. the Pain Perdue is made with sourdough bread, and served with griddled Canadian bacon and maple syrup. Each menu item is served with fresh fruit or hash browns and their bloody mary is no joke. We couldn’t have a brunch list and not include a lox and bagel entrée—it just wouldn’t be right. Look no further than Sugarbakers for a delicious all-time brunch favorite. The meal comes with smoked salmon on your choice of a plain or everything (obvious choice) bagel with cream cheese, sliced tomatoes, cucumber, red onions, and capers, with a cup of fresh fruit. Pro tip: order a side of their potatoes O’Brian regardless of what meal you decide on. What could possibly be better than brunch itself? Well, the answer to that is quite simple—a breakfast buffet! 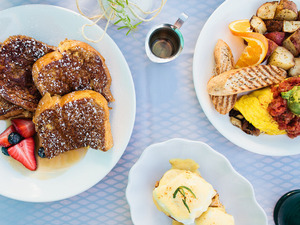 For $19, you can partake in unlimited fresh fruits, yogurts, cereal, a bread and butter bar featuring oven-baked fresh breads and bakery selections, farm fresh eggs and omelets cooked to order, Applewood smoked bacon, sausage, breakfast potatoes...we could keep going, but there is no way you aren’t sold yet. The Exchange’s resident omelet king, Logan, is whipping up an eggs benedict you won’t ever forget. This delicious brunch entrée is jammed packed with flavor and pairs perfectly with any of their brunch cocktails. Although they technically don’t have a Sunday brunch, we couldn’t leave them off this list. Anyone who is aware of Shoreline Sandwich Co. is aware of their scrumptious breakfast menu. 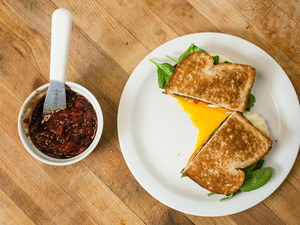 The Artisan Sandwich (an award-winning sandwich might we add) is a delicious combination of a fried egg, spinach, cheddar cheese, and their homemade tomato jam all packed between two slices of toasted wheat bread. The people talked, and Tannin’s listened. Brunch is officially served at your favorite wine bar and there is no shortage of good food to eat. This particular menu item might help those who are using brunch as a way to get over Saturday night’s activities. The Breakfast Flat comes with kale pesto, roasted tomato sauce, chorizo sausage, and Poivron peppers. 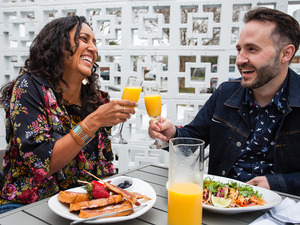 Even if you don’t go for the food (which you should), you will also find bottomless mimosas. Chef Ben takes pride in the authentic eats she whips up in the kitchen. Their Sunday brunch menu is no different. The motto is East meets West and they sure do deliver. Their Thai Tea French Toast comes complete with a french baguette soaked in Thai tea, topped with powdered sugar and sweet condensed milk and a side of candied bacon and fresh fruit. If you are looking for Sunday brunch on the Island, look no further than Black Sheep Bistro. 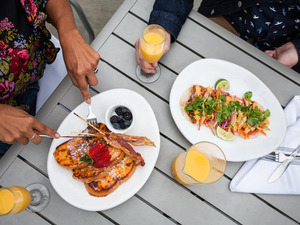 Bottomless mimosas should be a reason alone for you to make this your brunch destination, but their food is just as amazing. Try the Fried Boneless Pork Chop served with a sunny side up egg, red eye gravy, and garlic potato pearls. Hester’s Café is known for many things—their fresh baked goods, their awesome coffee, those potato chips...just to name a few. However, you most certainly should not overlook their brunch menu items. Take the Corpusborg for example. An omelet stuffed with roasted chicken, onions, green chiles, tomato, pepper jack cheese, topped with avocado and salsa. With three locations to choose from, there is no excuse to not brunch with Hester’s. Let’s all be honest with one another. Although everyone loves a good pancake on a Sunday morning, the real reason we are all brunching it up is to have an acceptable excuse to drink at 11 AM. 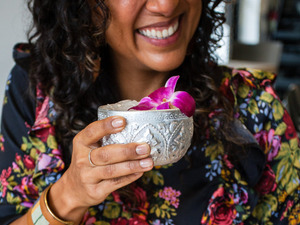 What is it about brunch specific libations that make us feel so fancy and fun? Maybe it is because breakfast staples such as bacon and toast turn into garnishes. Perhaps it is because champagne just tastes better in the morning. 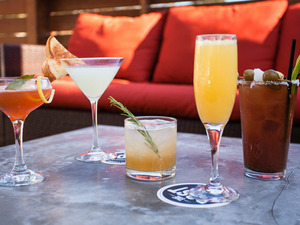 Whatever the reason is, we scoped out the best brunch cocktails in town! You’ve probably never seen a martini glass finished with a slice of toast, but at The Post, that is exactly what you will get when ordering a Breakfast Martini. This concoction is made from Bombay Sapphire, lemon juice, Cointreau, and light marmalade. Looking for the perfect wake-me-up? This will do the trick. Crown Maple and orange juice with a slice of bacon is the way Vino Mio gets down with brunch. Sunday Funday is taken to a whole new level over at BUS. While they have mimosa specials galore, this cantaloupe cocktail with tequila and lime is making us lose our minds! lemongrass vodka, coconut, lime, and orange bitters and is garnished with an edible orchid. A brunch cocktail is only as good as it’s garnishes and this bloody mary is no exception. 16 oz-vodka and house-made bloody mary mix are perfectly topped with a bacon skewer, cocktail onions, olives, and a celery stick.